Summary: The Support for All Pregnancy Options Act demonstrates how the abortion rights movement supports a range of common sense solutions to reduce unintended pregnancy, to make abortion safe, accessible and affordable to all, and to support women who bring their pregnancies to term. The abortion rights movement supports the full range of options for women who are or might become pregnant. Reproductive rights and justice includes policies to reduce unintended pregnancy; to make abortion safe, accessible and affordable to all; and to support women who bring their pregnancies to term. Women need access to all reproductive options and, therefore, we must make all forms of contraception available and affordable. Each year nearly half of pregnancies are unintended. As a Colorado program dramatically proved, when all contraceptive options are made fully available to women, it contributes to the dramatic decline of unintended pregnancies. Women need access to all reproductive options and, therefore, we must make abortion more affordable. Thirty-three states and the District of Columbia prohibit the use of state Medicaid funds for abortions, except in limited cases. 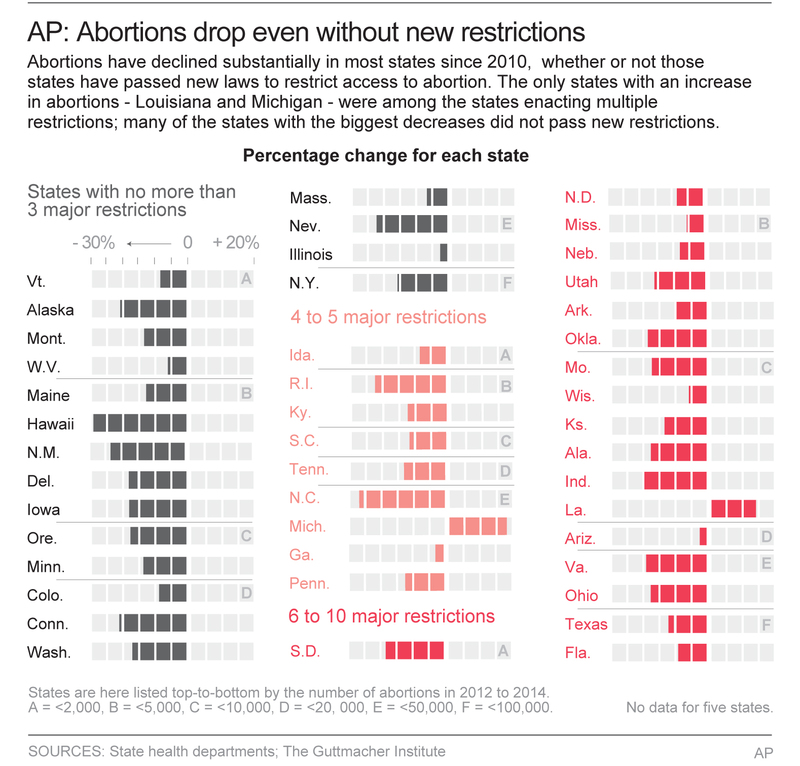 Twenty-five states prohibit abortion coverage in their insurance exchanges. Twenty-one states prohibit abortion coverage for state employee health plans. And ten states prohibit abortion coverage in standard private insurance plans. No woman should have the decision to have, or not to have, an abortion made for her based on her ability or inability to afford the procedure. Women need access to all reproductive options and, therefore, we must we make abortion more accessible. Because of restrictive laws and physical threats, the number of abortion providers has declined in recent years. The American College of Obstetricians and Gynecologists (ACOG) recommends allowing trained advanced practice clinicians (APCs)—nurse practitioners, certified nurse-midwives and physician assistants—to perform aspiration and medication abortions, yet only a few states allow it. Women need access to all reproductive options and, therefore, we must ensure fair workplace treatment of pregnant women and mothers. Pregnant women and women who have recently given birth need reasonable accommodations in the workplace. Women need access to all reproductive options and, therefore, we must ensure that reproductive healthcare clinics are not forced to close because of politics. At least 24 states have Targeted Regulation of Abortion Providers or “TRAP laws” that are designed to close abortion clinics. Most often, the restrictions dictate that abortions be performed at sites that are the functional equivalent of ambulatory surgical centers, or even hospitals, which makes the delivery of health care services prohibitively expensive. Other TRAP laws require clinicians at abortion facilities to have admitting privileges at a local hospital or mandate transfer agreements with hospitals, effectively giving hospitals veto power over whether an abortion clinic can exist. 2) Abortion care is one of the safest medical procedures in the United States. 3) Approximately three in ten women will have an abortion in their lifetimes, and will need access to safe, legal facilities to obtain abortion care without delay. 4) Women need access to all reproductive options and, therefore, we must make all forms of contraception available and affordable. The United States has one of the highest rates of unintended pregnancy among industrialized nations. Each year, nearly half of pregnancies are unintended. Women rely on contraception for a range of medical purposes in addition to birth control, such as regulation of cycles and endometriosis. Women need complete and medically accurate information about every contraceptive option, including emergency contraception, and they need pharmacies to deliver the chosen option without delay. 5) Women need access to all reproductive options and, therefore, we must make abortion more affordable. No woman should have the decision to have, or not to have, an abortion made for her based on her ability or inability to afford the procedure. Since 1976, the federal government has withheld funds for abortion coverage through the Medicaid program as well as other federal health plans and programs. Seventeen states, however, have policies that include Medicaid abortion coverage because it is wrong to coerce women who cannot afford abortion to, for no other reason, carry a pregnancy to term. 6) Women need access to all reproductive options and, therefore, we must we make abortion more accessible. The number of abortion providers has decreased due to practice restrictions and threats of violence. The American College of Obstetricians and Gynecologists (ACOG) recommends allowing advanced practice clinicians (APCs)—nurse practitioners, certified nurse-midwives and physician assistants—to perform aspiration abortions and medication abortions. Studies show that trained APCs are fully qualified to provide aspiration and medication abortion services. 7) Women need access to all reproductive options and, therefore, we must ensure fair workplace treatment of pregnant women and mothers. Women in the workplace who request accommodations in order to maintain a healthy pregnancy or to recover from childbirth are being removed from their positions, placed on unpaid leave, or fired. Not only do these policies harm pregnant women and mothers, but all women who employers may perceive negatively because of their potential to get pregnant. 8) Women need access to all reproductive options and, therefore, we must expand Medicaid to ensure that women and their families have access to health care coverage. Health coverage for all is essential, but this is especially true for pregnant women and young children. Pregnant women are far more likely to obtain needed pre-natal care when they have insurance. Further, unhealthy children tend to grow up to be unhealthy adults, and uninsured preschoolers struggle more when they reach grade school because of untreated medical conditions. Approximately seven percent of all children age five and younger are uninsured, many of them because they live in states without Medicaid expansion under the Affordable Care Act. 9) Women need access to all reproductive options and, therefore, we must ensure that reproductive healthcare clinics are not forced to close because of politics. In 2011, 89 percent of U.S. counties lacked an abortion facility. In 2015, four states had only one abortion provider, and at least ten states had three or fewer abortion providers. Clinic closures can force women to travel long distances to reach the nearest clinic, or force women to delay care as they arrange transportation, time off from work, and save additional money for travel or lodging costs. Women who face these obstacles are more likely to seek out less safe alternatives to legal abortion. 10) Women need access to all reproductive options and, therefore, we must prevent discrimination that limits the availability of foster care and adoption. There is a shortage of qualified individuals willing to adopt or foster a child in the child welfare system. As a result, thousands of foster children lack a permanent and safe home. Child welfare agencies must not use sexual orientation, gender identity or marital status as a means to discriminate in adoption and foster care recruitment, selection and placement. (B) PURPOSE—This law is enacted to protect the health, safety and welfare of women by supporting their rights to avoid pregnancy, obtain an abortion, or have children. 7) “Without delay” with respect to a pharmacy providing, providing a referral for, or ordering contraception, or transferring the prescription for contraception, means within the usual and customary timeframe at the pharmacy for providing, providing a referral for, or ordering other products, or transferring the prescription for other products, respectively. a) If the customer prefers to obtain the contraceptive through a referral or transfer, the pharmacy shall locate a pharmacy of the customer’s choice or the closest pharmacy confirmed to have the contraceptive in stock; and refer the customer or transfer the prescription to that pharmacy. 1) “Abortion” means any medical treatment intended to induce the termination of a pregnancy except for the purpose of producing a live birth and any related services, including but not limited to diagnostic, counseling, referral, or follow up services. 2) “State” means the state, any state agency, and every county, city, town, municipal corporation, quasi-municipal corporation, and public institution in the state. The provisions of this Section shall be severable, and if any phrase, clause, sentence or provision is declared to be invalid, is preempted by federal law or regulation, or results in noncompliance with federal requirements that are a condition to the allocation of federal funds to the state, those words are inapplicable and the validity of the remainder of this Act shall not be affected. 1) “Aspiration abortion” means medical treatment intended to induce the termination of a pregnancy by dilating the cervix and using suction to remove the fetus and related pregnancy material from the uterus. 3) “Medication abortion” means the use of medication intended to terminate a pregnancy so that it does not result in a live birth. 4) “Nurse practitioner” means a person licensed under [insert relevant provision]. 5) “Physician assistant” means a person licensed under [insert relevant provision]. 1) A nurse practitioner or a certified nurse-midwife is authorized to prescribe and supervise medication abortions and to perform an aspiration abortion if he or she has successfully completed training and achieved clinical competency and adheres to standardized procedures approved by the [insert relevant board governing nurse practitioners and certified nurse-midwives]. 2) It is unprofessional conduct for any nurse practitioner or certified nurse-midwife to prescribe or supervise an aspiration or medication abortion without prior successful completion of training and validation of clinical competency. 3) The [insert relevant board governing nurse practitioners and certified nurse-midwives] shall issue rules for training, clinical competency, and standardized procedures for medication abortion and aspiration abortion. 1) A physician assistant is authorized to prescribe and supervise medication abortions and to perform an aspiration abortion if he or she has successfully completed training and achieved clinical competency and adheres to standardized procedures approved by the [insert relevant board governing physician assistants]. 2) It is unprofessional conduct for any physician assistant to prescribe or supervise an aspiration or medication abortion without prior successful completion of training and validation of clinical competency. 3) The [insert relevant board governing physician assistants] shall issue rules for training, clinical competency, and standardized procedures for medication abortion and aspiration abortion. 2) “Reasonable accommodation” means such accommodation that can be made for an employee that shall not cause undue hardship in the conduct of the employer’s business. Accommodations may include, but are not limited to, acquisition of equipment for sitting, more frequent or longer breaks, periodic rest, assistance with manual labor, job restructuring, light duty assignments, modified work schedules, temporary transfers to less strenuous or hazardous work, time off to recover from childbirth, or break time and appropriate facilities for expressing breast milk. 3) “Undue hardship” means an action requiring significant difficulty or expense when considered in light of factors such as: the nature and cost of the accommodation; the overall financial resources of the employer; the overall size of the business of the employer with respect to the number of employees, and the number, type and location of its facilities; and the effect on expenses and resources or the impact otherwise of such accommodation upon the operation of the employer. The fact that the employer provides or would be required to provide a similar accommodation to another employee or employee(s) shall create a rebuttable presumption that the accommodation does not impose an undue hardship on the employer. “Placement decision” means the decision to place, or to delay or deny the placement of, a child in a foster care or an adoptive home, and includes the decision of the agency or entity involved to seek the termination of birth parent rights or otherwise make a child legally available for adoptive placement. 3) Make any other decision on the basis of the sexual orientation, gender identity, or marital status of the prospective adoptive or foster parent, or the sexual orientation or gender identity of the child involved. In addition to all other remedies, any individual who is aggrieved by an action in violation of this section may bring a lawsuit seeking relief in [insert court of appropriate jurisdiction].